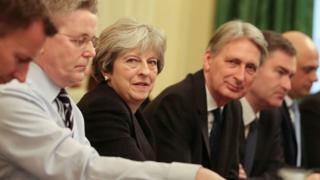 Theresa May has said her reshuffle makes the government look "more like the country it serves" with a "new generation" of ministers brought in. The PM has appointed several new faces to her ministerial team. The mostly junior ministerial appointments come after Monday's cabinet-level changes. These triggered the resignation of education secretary Justine Greening and were branded a "lacklustre PR exercise" by Labour. Of Tuesday's appointments, six men and eight women were new additions to government, including five from ethnic minorities and 11 who were elected in 2015. Six of the women - all elected in 2015 - have been appointed as junior whips, who will be involved with enforcing party discipline. Downing Street said that following the reshuffle there were more women attending cabinet, more female ministers and more members of the government from ethnic minorities. The number of women who are full cabinet members has remained the same as before at six. But the number of other senior female ministers also attending cabinet has risen from two to four, taking the total number of women around the table to 10. Day two arguably went better for the prime minister than day one. She is able to claim, as planned, to have upped the numbers of women in government and new ministers from ethnic minorities. The talk in Downing Street is of a new "talent pipeline", the jargon for bringing on a new generation to be ready whenever big jobs available next time round. But there is a lot of muttering among MPs about the overall logic of the reshuffle. Some individual decisions seem puzzling - moving Rory Stewart from International Development, in which he is regarded as a proper expert - to the prisons brief for instance. Making the up-and-coming Brexiteer lawyer, Dominic Raab, the new Housing Minister, stirring controversy by promoting Esther McVey to secretary of state in a department she already controversially served in, DWP, where she was near the top of the Labour hit list. There is real anger too among some members of the government at how Justine Greening was treated on Monday night, compared to her male colleagues. Mrs May said it would allow "a new generation of gifted ministers to step up and make life better for people across the whole UK". The latest changes include Jo Johnson being moved from his universities role to transport, and Suella Fernandes becoming a minister in the Department for Exiting the EU. Mr Johnson had been in the firing line over the appointment of columnist Toby Young to the board of the government's universities regulator. The brother of former London mayor Boris Johnson, he will also be the minister for London in his new role. The most high-profile cabinet ministers all kept their jobs in the reshuffle, in which Health Secretary Jeremy Hunt is believed to have persuaded the PM to keep him in post with a beefed-up role rather than move him to another department. Speaking on the BBC's Daily Politics, new Conservative deputy chairman James Cleverly said he was not worried about the hostile newspaper headlines generated by the reshuffle. "Today and yesterday were about reshuffles and that always causes lots of froth and drama in the media," he said. "Today's headlines are what they are - tomorrow and onwards we will be getting the really important stuff which is about what we are doing, what we are delivering in government." Two departments were renamed - housing was added to the title of the communities department while the title of Mr Hunt's health brief now includes social care. Alan Milburn, the former Labour minister who was until recently the government's social mobility tsar, said Ms Greening's departure was "a loss as far as social mobility is concerned", saying she had been "actually getting on and doing something". Sorry to see @JustineGreening leave government - she brought her non-nonsense, northern accountant's eye to every brief and is a real role model for LGBT+ Conservatives. In her resignation statement on Monday evening, Ms Greening said: "Social mobility matters to me and our country more than a ministerial career." Labour leader Jeremy Corbyn said: "The government's big plan for the new year is to dodge the real issues and reshuffle the pack in a pointless and lacklustre PR exercise. "It's simply not good enough. You can't make up for nearly eight years of failure by changing the name of a department."